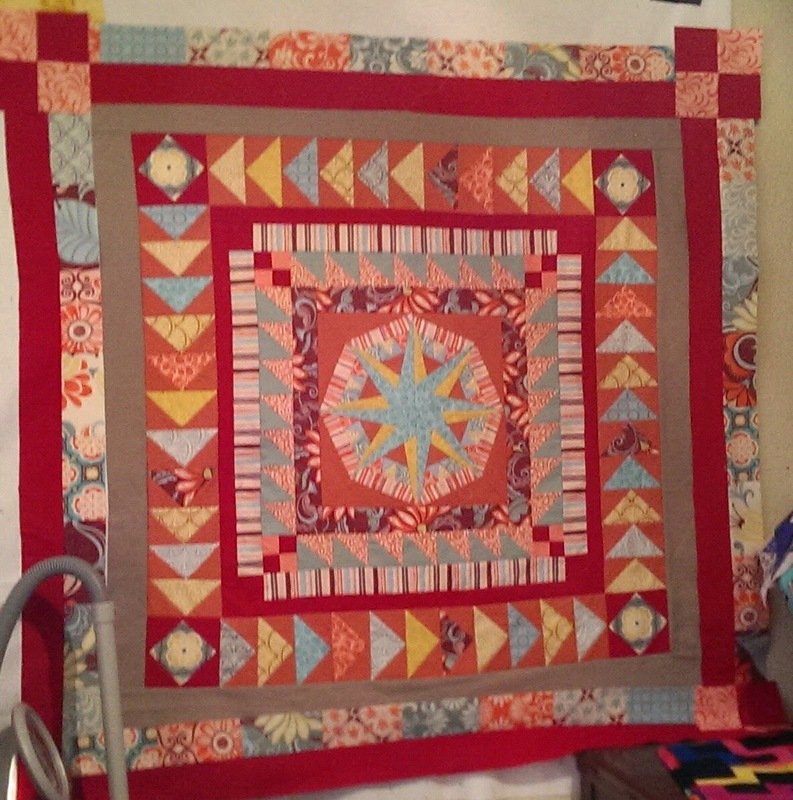 Modern Quilters Ireland - old: Medallion Suggestions, Anyone? 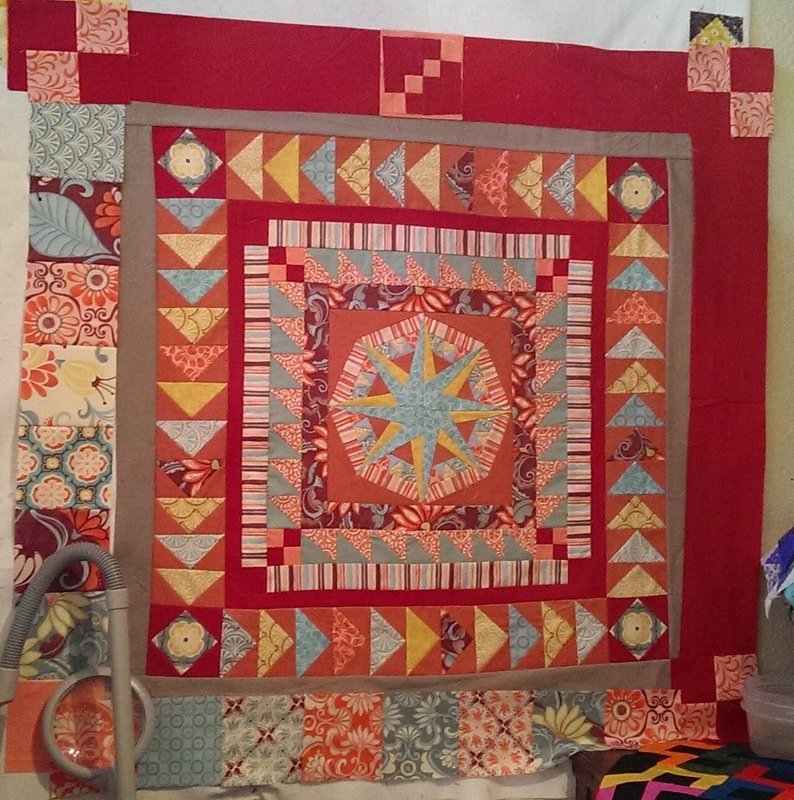 I have been stalled on my modern medallion QAL quilt that the Modern Quilt Guild of Ireland has been doing...I finally just started playing around trying to figure out what to do next. I had the idea to put red on two sides and squares on the other two sides...then wanted to repeat the four patch that I had done earlier so I put those up there...then felt it needed more so I made that weird thing that is the top center (I was planning to add peach to all sides of it and randomly put it in the red strip--right now it is a block on a peach square on the strip). I have not attached any of it. I really think I like the first one better (now that I would have to completely remake all the parts but the corners, lol). I do not have a great quantity of any solid color that is in this quilt other than the red and I am using layer cakes of the Fandango fabric. Any suggestions? Which is better or do you have a better idea? I am a pattern follower and this entire quilt is out of my comfort zone! I keep thinking I should call it done and put these odds and ends in the backing and be done with it! Trusty HSTs - How Do You Make Them?